I love wearing patterned suits, I’ve been known to wear them to weddings instead of a dress (light colours in light fabrics or floral print work well). But a good suit can be expensive, office dress codes can be uncompromising and so our suits for work tend to be purchased in the typical black, navy or grey as investment in longevity. If you work in a conservative environment it can be easy to dismiss a patterned suit as something that isn’t appropriate to wear to the office, but here are some tips on how to wear a patterned suit and rival the men for variety and professionalism. As with any investment in your work wardrobe, my approach is to go for the best fitting suit you can afford. It’ll last longer, the fit will be better and you’ll be glad that you did so that you have a suit that you feel comfortable in and that you can come back to time and time again. For tips on how to buy the best fitting suit, this blog post by Corporette.com is a good read before you make an investment. Regardless of what is trending in the fashion world at the time, don’t clash the patterns in your suit. You should wear the same pattern in the jacket as you do in the skirt or trousers (unless you’re a person described in point 9 of course). Combining different patterns works for men when done properly, the suit, tie and on occasion the shirt, but it’s not advisable to clash the jacket and trousers together for either men or women. In my honest opinion, the clashing of patterns in any ensemble is risqué in an office environment unless you work in the creative industries (and not, say, in the finance or legal department), it’s a trend best left to brunch or an evening out with the girls, but that’s just my two cents. Stick to a blouse or shirt preferably in a muted colour palette underneath the jacket to pare down the pattern and to give the pattern the attention it deserves. Remember, less is more. Patterned suits are typically seen with jackets and trousers, but there are often skirt options. Opting for a skirt to is likely to make your look slightly more conservative (just remember your skirt should be the right length). You have probably realised that most of these points have a carve-out for the creative industries which is as expected and this carve out refers specifically to the fashion industry as these folks are morely likely to get away with wearing a patterned suit to an interview. But my advice for those of us not working in the fashion industry is to not wear a patterned suit to an interview regarding of how smart it is or how well the suit fits – it is certainly envelope pushing. Your potential employer should remember you for your skills, experience and interview technique and not your choice of suit for the occasion which your interviewer may or may not appreciate – why take the risk? When choosing patterns to wear to the office, you should consider the type of fabric of your patterned suit and make sure that it complements the season. For example, houndstooth and Princess of Wales checked patterns are more typically worn in Winter (hence why the model above has on tights). You’ll see lots of coats and jackets in these prints for this reason. I love this blog post from Glamradar.com about how to wear Houndstooth. Conversely, gingham and smaller checks with less heavy lines and detailing tend to be worn in Summer and come in lighter fabrics. As much as a love floral patterns (who doesn’t?) I would seriously consider if you are pushing the envelope with a head-to-toe floral patterned suit to the office. Again, if you work in the creative industries, possibly. But for those of us who do not, I think it’s a no. For context, I was once ‘told off’ for wearing floral trousers to what I consequently deduced was a fairly conservative office and as expected the floral trousers were definitely not acceptable. I was categorically told that they were not even appropriate for dress down Friday either(!) I could however, get away with wearing the floral shirt in the same print along with my charcoal suit and not get in any bother. 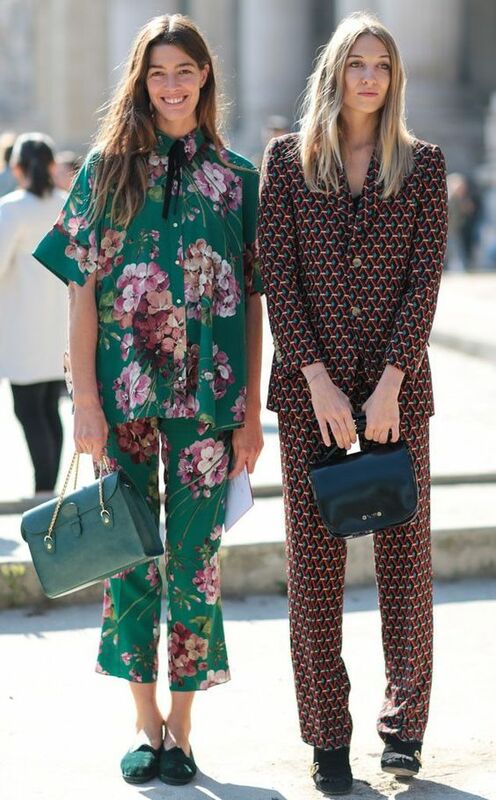 Floral patterned suits should be reserved as alternative wedding guest attire, other celebrations generally (paying attention to the dress code of course) and possibly can be worn to the races if you’re not a dressy type of person, although I would generally steer clear of floral patterned suits in the office. The current athleisure-wear trend is the perfect way to wear a patterned suit in a creative office with the accompaniment of a white t-shirt and white trainers and is also a good look for dress down or casual Fridays’. Exercise with caution though (excuse the pun), trainers to the office is only suitable for a very casual office so it may not be appropriate for every environment, yes even on a Friday! I know that technically wearing a patterned suit to the office as separates is not then a ‘suit’, but if you really don’t feel comfortable wearing the patterns head-to-toe, then you can always wear each piece as a separate and combining each with you standard grey, black or blue suit. As with any suit, do see your patterned suit as an investment; again the best you can afford and try to opt for a classic cut that won’t go out of style too quickly and you can reach for it for years to come. Traditional patterns like, houndstooth, tweed, possibly polka dots (which I love!) are all patterns that stand the test of time and they will be worn for years to come. You cannot go wrong buying a patterned suit with a heritage pattern. Modern prints, although not necessarily tried and tested for longevity they are unique and will always therefore, be special pieces to come back to. Whilst suits have always been associated with menswear for formal or business occasions, patterned suits can transition into the evening and other occasions quite easily. They’re frequently adorned by celebrities on the red carpet along with some gorgeous heels and a statement bag which makes this a really easy look to pull off. Making my point about the patterned suit being an investment completely true as it’s not just something to wear for work. Have fun with it! What other advice would you give for wearing patterns to the office?